a.b.e.® Construction Chemicals supplies a wide range of construction commodity products which include a range of shutter release agents, curing compounds, drainage products, malthoids, non-shrink grouts and high strength mortars. There are also agricultural and timber products, as well as some preservative wood products (carbolineum and creosote) sold by a.b.e.®. The automotive industry is supplied with underbody sealants, high temperature gasket sealants and other allied industries, making this segment very comprehensive. 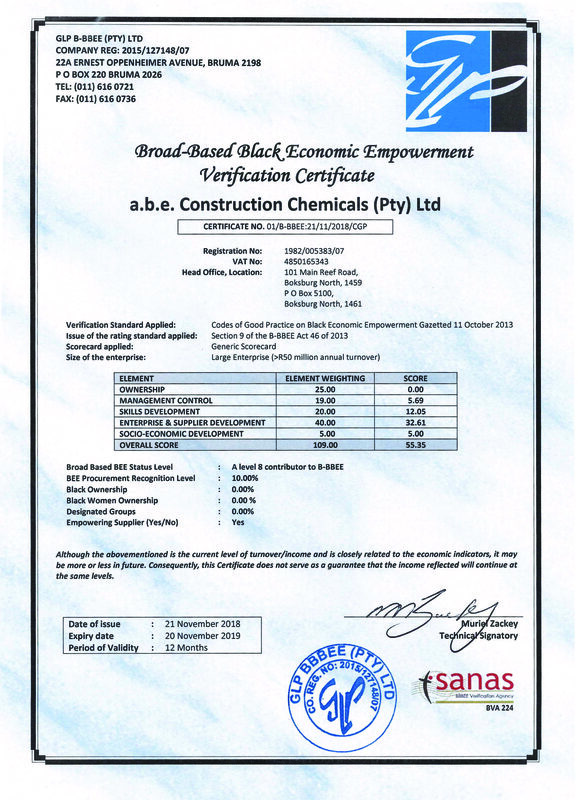 a.b.e.®’s range of timber protection products is based on bitumen and creosote. a.b.e.® manufactures an industry standard range of wound protection products used in grafting, pruning and tree surgery. a.b.e.®’s range of automotive and industrial products is based on bitumen, silicone and polyurethane. Typical applications include underbody coatings for vehicles, automotive sealants, high temperature gasket sealants. Sealants are sold to shower manufacturers and coatings to the air-conditioning and pipe industry.